MY MOTHER’S NEIGHBORS HAVE AN ORCHARD in Sequim, Washington. Apples, plums, pears. 2013 yielded a bounty of Shiro plums and lots of plum jelly and plum butter. 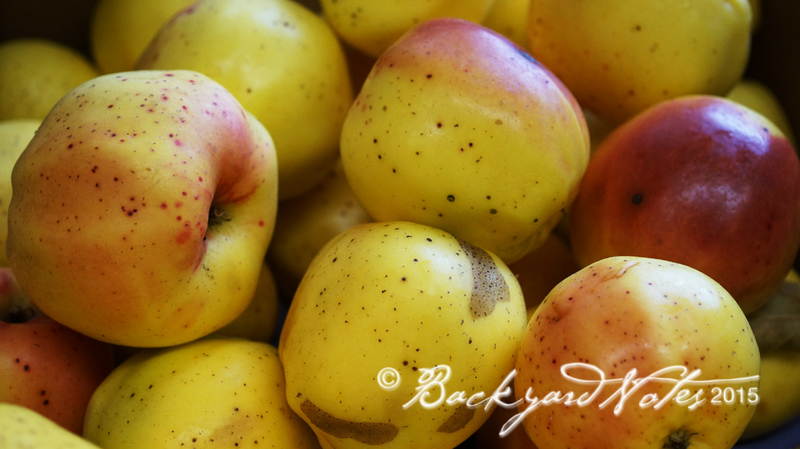 In 2014 they picked a bumper crop of apples and I was a lucky recipient of Golden Delicious and Winter Banana apples, a variety new to me. I brought home my first five or so, pounds at the end of October and I still had few pounds of our homegrown Spartan apples (after making Kevin West’s Apple Jam with Honey and dates—my addition, from Saving the Season—and Apple Chutney). I combined the remaining bounty of apples with some beautiful Oregon cranberries, for Cranberry-Apple Jelly. I washed and quartered (no peeling or coring needed) five pounds of apples and placed them in a large pot with 12 ounces of cranberries, three clementines, 2 cups white wine (rosé will work nicely here), four cups of water, three, three inch cinnamon stick, three bay leaves and one tablespoon of black peppercorns (in a spice bag). 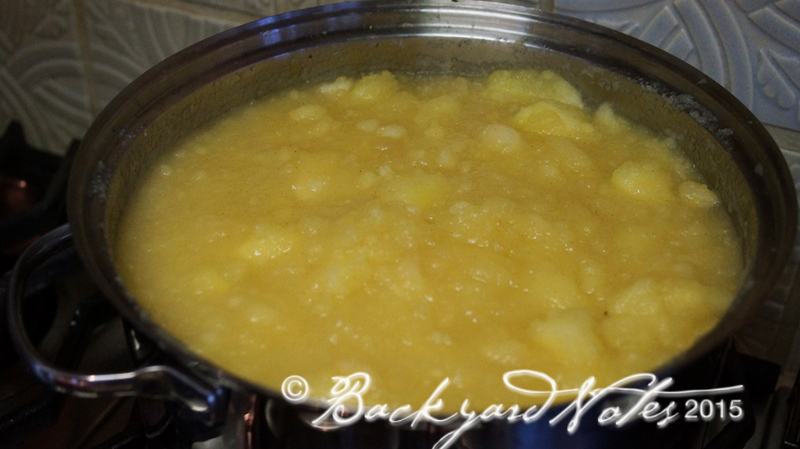 Bring to a boil, partially cover and simmer 45 minutes or so until the apples are very soft and falling apart. Remove the spices and bay leaves and transfer to a fine sieve/strainer lined with cheesecloth or a chinois (pictured above) and allow to drain up to 8 hours; do not push on the solids or you will have cloudy juice. 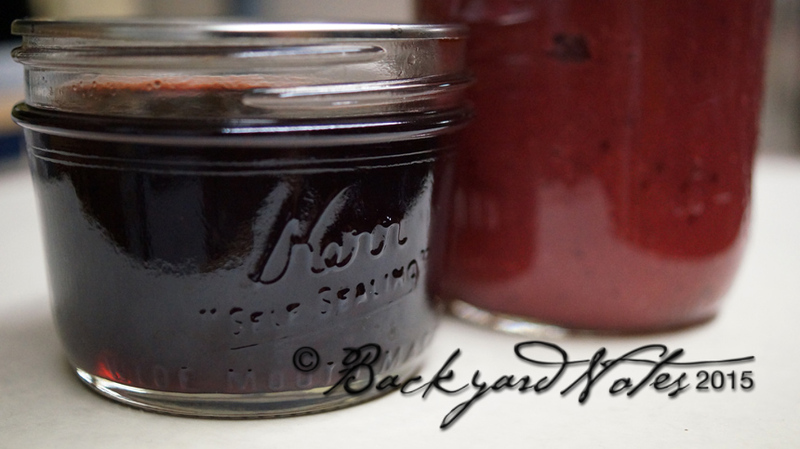 This yielded seven cups of juice and three half-pints of jelly—the big drawback to making jelly—a small yield for the effort expended, but it tastes great! I liked the jelly so much that I asked my mom if her neighbors had more apples. Yes, they did! How about twenty pounds of Winter Bananas? Please take them! Half of them went into a small fridge and the rest sat in their box in the garage. In early December I made a second batch of apple-cranberry jelly. Ten pounds of winter Banana apples, three pounds of Oregon cranberries, two large pots and two cups of water; this time I ended up with four and a half quarts of juice so I made two batches of jelly. One batch was straight forward and the second included the addition of port and star anise. Yield: 8 half-pints of jelly. Ten pounds of apples and three pounds of cranberries yielded a fair amount of apple-cranberry pulp that tasted too good to toss out. 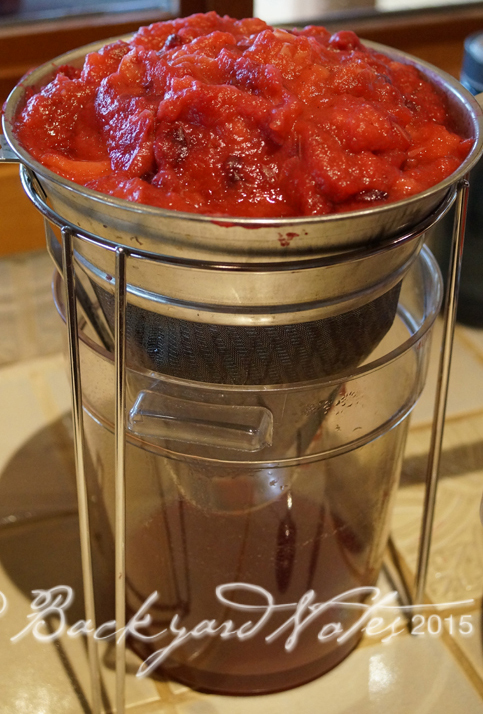 I put the pulp through the trusty old Foley food mill and I had instant apple-cranberry sauce. These apples were so sweet that even with tart cranberries, no sugar was needed (to suit our taste). For each four cups of pulp, I added back three cups of juice and two tablespoons of lemon juice. I canned 10 pints of it. It is delicious stirred into thick yogurt. 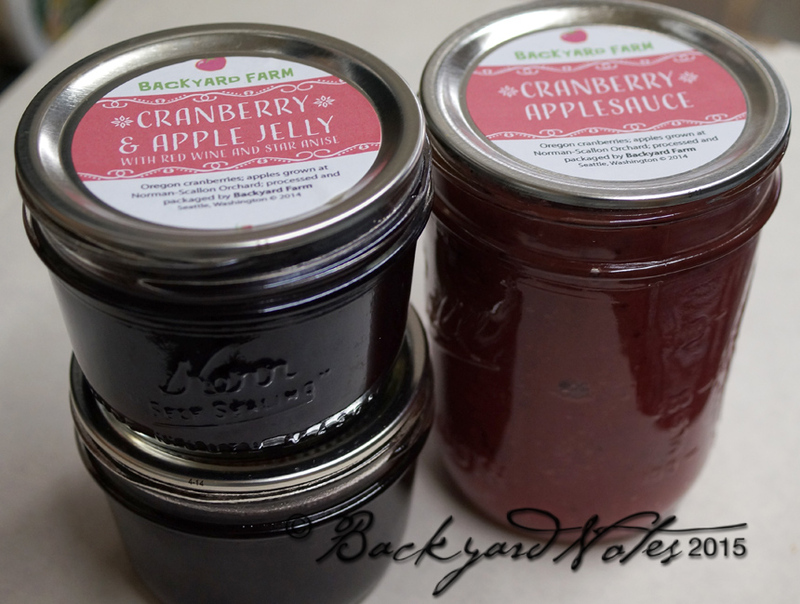 Mom’s neighbors received jelly and applesauce and family received apple-cranberry jelly at Christmas. January rolled around and we getting ready to take off for the desert. There were still lots of apples in the box and mini-fridge that kept staring at me every time I walked into the garage. 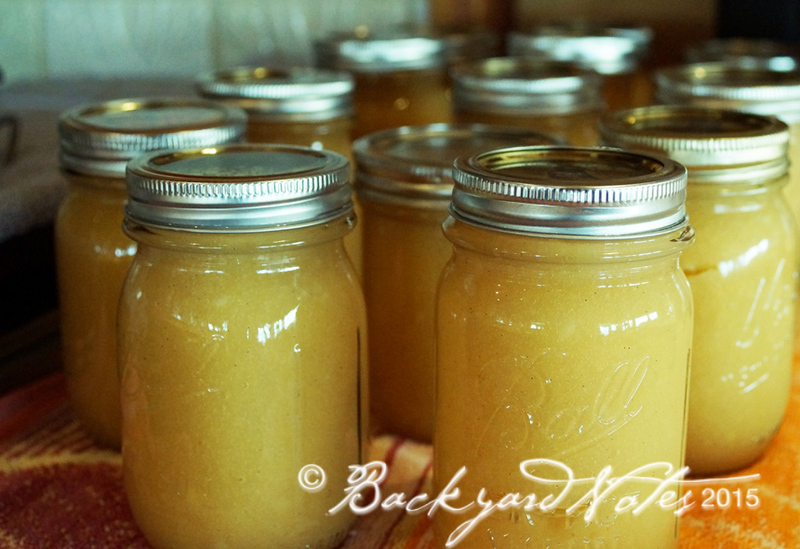 I couldn’t bear to toss them so I broke down and made applesauce–16 pints of it to be exact. The apples were still pretty firm, only a few soft or unusable. And by sitting around for a few months, the sugar had concentrated and they were very sweet. 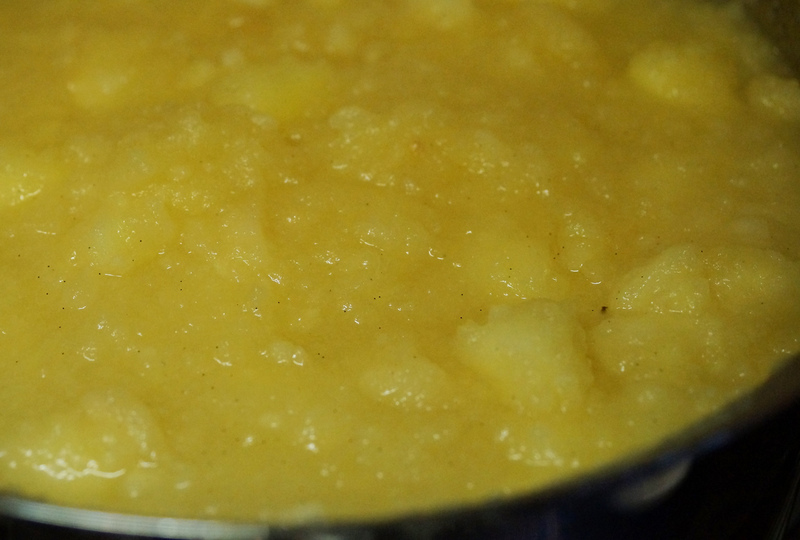 This batch of applesauce did not need the addition of sugar either. Hmmm…only two of us in the household and a lot of applesauce. Naturally, mom’s neighbors got more applesauce. Mom took a few pints. My neighbors with a baby/toddler received their share too. And two neighboring households. And my two sisters. And there is still plenty to get us through until next fall. I won’t even think about canning until asparagus season begins sometime in April and May here.